October and November are the 2 months out of the year that I cook with pumpkin at all. 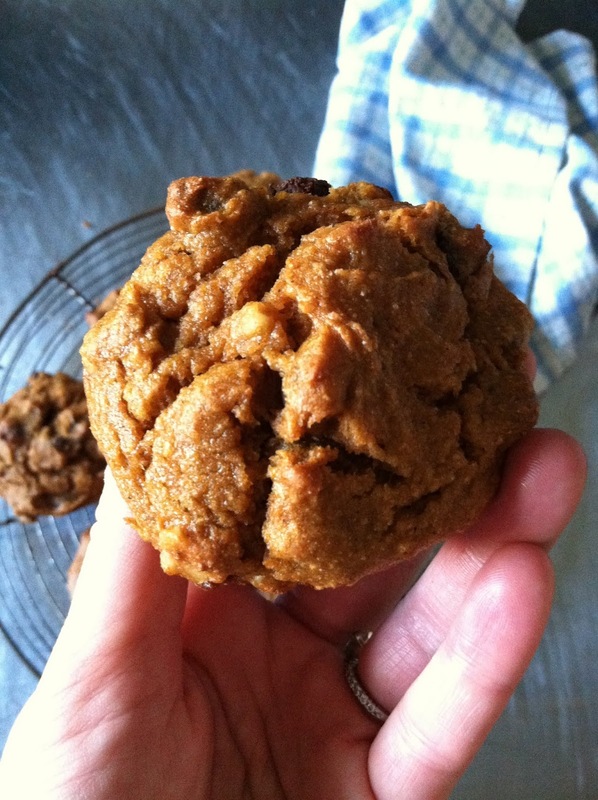 Canned pumpkin pops up (and disappears quickly) during this time, and while I know there’s a lot you can make with it, pumpkin muffins are my go-to for fall. 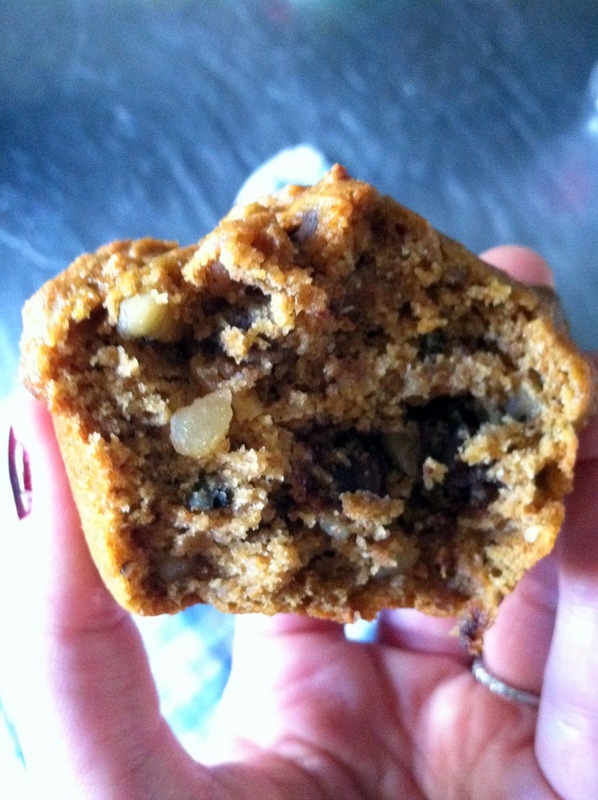 Pumpkin is loaded with fiber, and walnuts (and dark chocolate!) have heart-healthy fats and benefits. 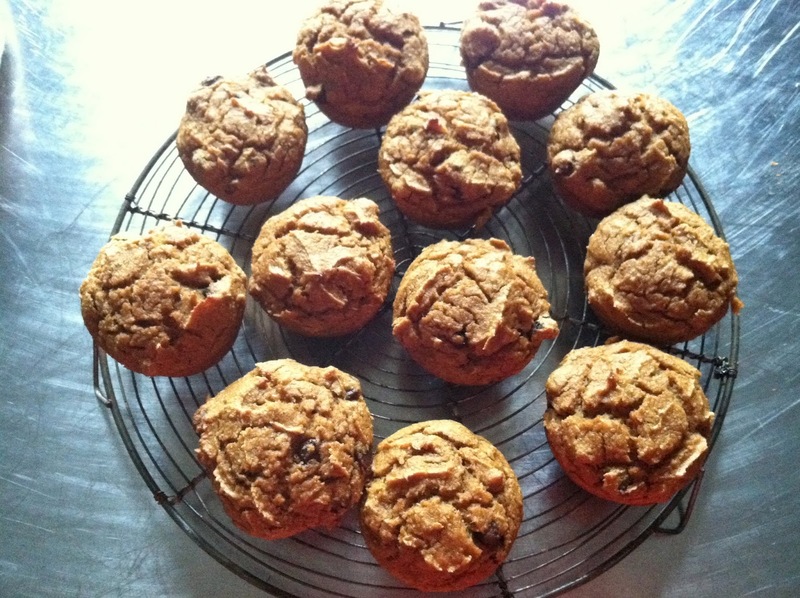 Whole wheat flour keep these muffins on the “good for you” side of things, and while there’s a cup of (organic) sugar in this recipe, there isn’t any oil or “traditional” baking fats. These pumpkin muffins stay moist and flavorful due to the pumpkin puree and greek honey yogurt, and they’re delicious. I made 6 large pumpkin-walnut-chocolate chip muffins and 6 large pumpkin-walnut raisin muffins by splitting the batter at the very end and mixing in the raisins and chocolate chips separately. This is the second batch I’ve made this week – they go fast! – 1 1/3 c. Libby’s pumpkin puree, or similar. Make sure you get pureed pumpkin, not pumpkin pie mix. 2. 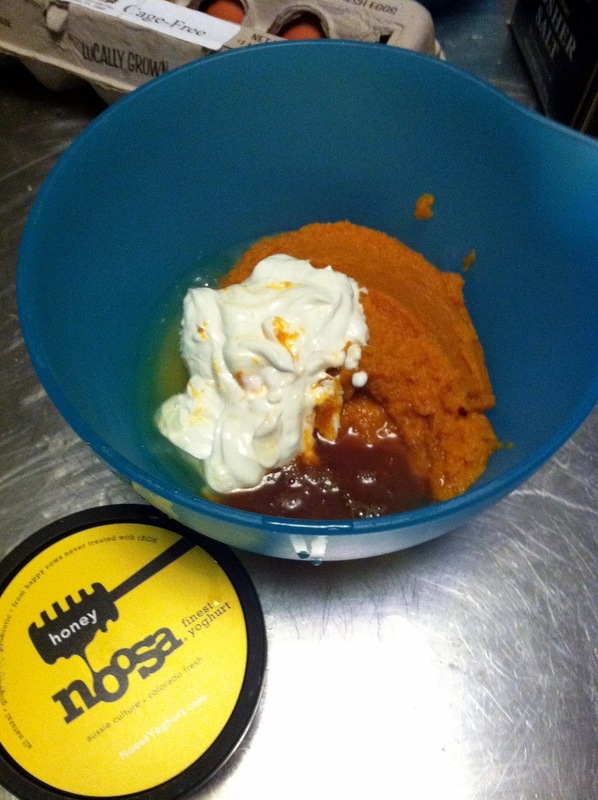 In a large bowl, combine the pumpkin, egg whites, honey yogurt, sugar, and vanilla. Stir with a whisk to combine. 3. 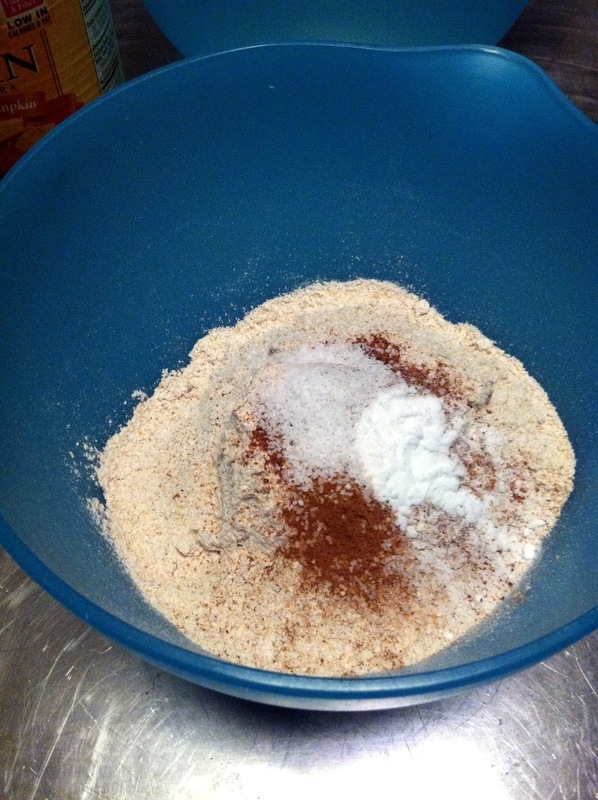 In a separate bowl, combine the flour, cinnamon, ginger, nutmeg, salt, baking soda, and whisk to combine. 4. Add the flour mixture to the pumpkin mixture a little at a time, stirring until just combined. Add walnuts (if using) and fold into the mixture. 5. 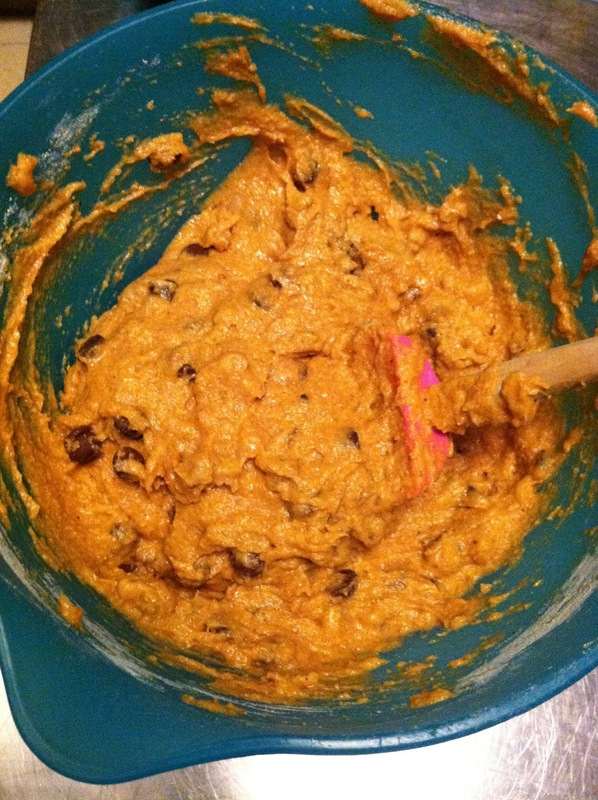 At this point, either divide the batter & walnut mixture into two bowls, and add 1/4 c. of chocolate chips to one bowl, and 1/4 c. of raisins to the other bowl to make 2 different kinds of muffins, or keep the batter mixture in one bowl and just add 1/2 c. chocolate chips or 1/2 c. raisins to the mixture. Combine, being careful not to overmix. 6. Spray a muffin tin with cooking spray, and spoon equal amounts of the batter into the muffin tins. 7. Bake for 20 – 25 minutes or until a knife can be inserted and removed cleanly. Don’t overbake, or muffins will get hard. Let cool and enjoy. 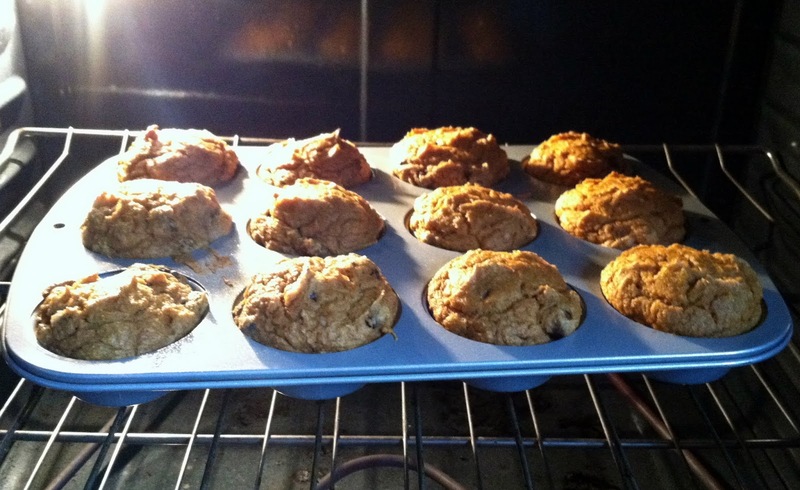 This entry was posted in healthy, muffins, pumpkin on November 8, 2012 by westyn.